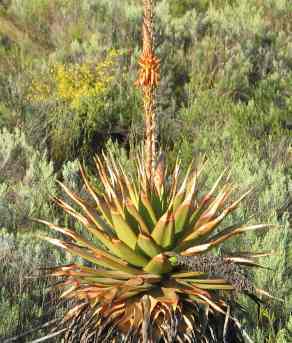 Aloe lineata (Aloaceae). Short trunk aloe. Compact medium-sized rosettes form on a stem that can be up to 2 meters in height. The stems are usually single and they are covered with the remains of old leaves. Leaves are a bluish-green color with fine striations that run parallel to one another on the leaves. The leaf surfaces are smooth and leaf margins are armed with sharp reddish-brown teeth. Inflorescences are simple and up to four are borne from each rosette, racemes are tightly packed with numerous buds. Flowers are a light pink to bright red colour. Flowers are tubular in shape. It flowers in late summer. Sowing : seeds germinate very well but may damp off if over-watered. Use a mixture of river sand, compost and soil to sow seeds in. Sprinkle the seeds evenly on the surface and cover with a layer of small pebbles. The pebbles help the seedlings to stay upright and prevent damping off. Keep seed tray in a dry warm corner and do not allow to dry out. Transplant the seedlings after one year. Locality : Ladysmith. Date of harvest : Dec 2018.